Since the birth of the nation, we have turned to stories about the American South to narrate the rapid ascendency of the United States on the world stage. The idea of a cohesive South, different from yet integral to the United States, arose with the very formation of the nation itself. Its semitropical climate, plantation production, and heterogeneous population once defined the New World from the perspective of Europe. By founding U.S. literature through opposition to the South, writers boldly asserted their nation to stand apart from the imperial world order. 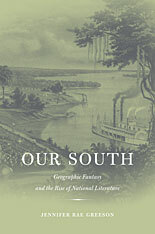 Our South tracks the nation/South juxtaposition in U.S. literature from the founding to the turn of the twentieth century, through genres including travel writing, gothic and romance novels, geography textbooks, transcendentalist prose, and abolitionist address. Even as the southern states became peripheral to U.S. politics and economy, Jennifer Rae Greeson demonstrates that in literature the South remained central to the expanding and evolving idea of the nation. Claiming the South as our deviant and recalcitrant “other,” Americans have projected an anti-imperial imperative of domesticating and civilizing, administering and integrating underdeveloped regions both within our borders and beyond. Our South has been a primal site for thinking about geography and power in the United States.